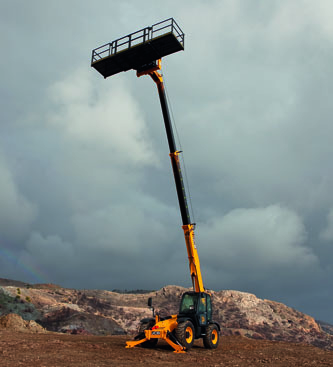 JCB has launched a telehandler work platform option for two of its HiViz Loadalls – the 535-125 HiViz and 535-140 HiViz. Designed and manufactured in-house, the work platform further increases the Loadall’s versatility. A third party access platform will remain available for the Loadall 540-140 and 540-170 models. Three platform sizes are available for the HiViz machines. These include a fixed basket 1.2 metres wide and 2.5 metres long; a fixed extendable basket, also 1.2 metres wide, but with a length of 2.5-5.0 metres. The third option is a slewing extending platform, offering a 1.2 metre width, a length of 2.5-5.0 metres and 180 degree rotation capability. All three platforms offer a payload of 400kg, an increase of 50kg on previous models. JCB says that the EN280 compliant carrier machine has stabiliser and boom interlocks to promote safe practice as well as hose burst protection valves fitted to all primary function hydraulic rams and stabilisers to prevent collapse in the event of pressure loss. An emergency get-down pump and emergency stop function ensure both operators and other site personnel can control the machine in the event of a malfunction. Both of the HiViz models can be ordered platform-ready from the factory but without the access basket, allowing customers to add the platform at a later date when required, increasing versatility and utilisation. The JCB-designed wireless-enabled remote control system provides accurate, low-cost precision control while working in the plaftform. A single key interlock facility ensures complete operator safety while working as an access platform. Rear axle lock boosts lifting envelope for maximum lift capacity.